Well, I'm a few days late...but at least it's still July! Happy Bloom Day, everyone! 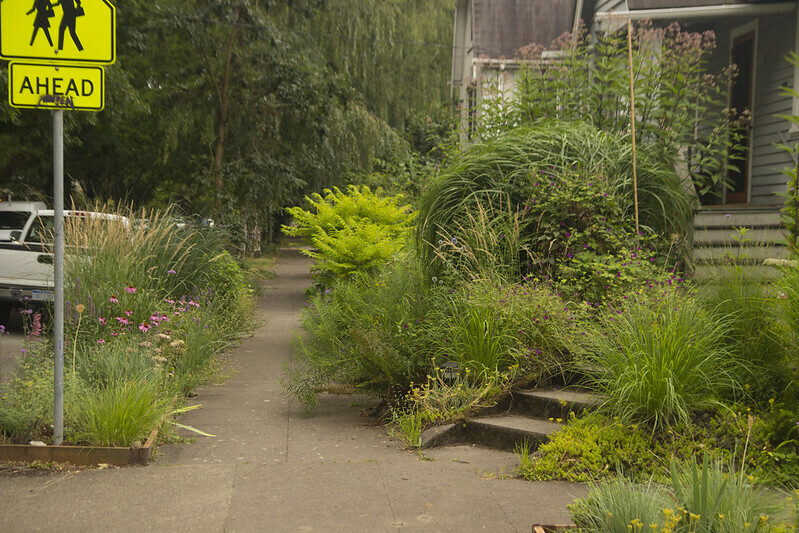 As you may have heard, we had the Garden Bloggers Fling here in Portland last week...and my garden was on the tour (which was terrifying)...but we survived it and now I can enjoy the garden without fretting about it being "presentable" ;-) I have to say, now that the stress is over, I find myself really missing all those bloggers...just another reason to go to the Fling next year in Toronto! 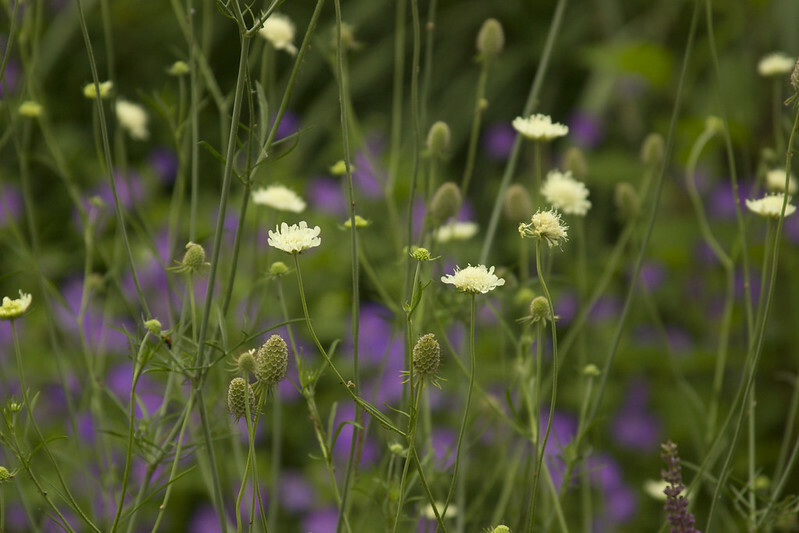 One of my new favorite flowers for this year (well, new to me) is Scabiosa ochroleuca. It's no surprise that I love it, considering how much I adore the similar Knautia macedonica...but this one seems a bit more upright and rigid...whereas the Knautia does tend to splay about after a while. Time will tell if this will behave the same way...we'll see. I know people shake their heads when they see I grow Epilobium angustifolium (Fireweed), but I can't help but love it...it's a little ridiculous and can easily get out of control...but I love the feeling of wildness and spontaneity it gives to the garden. 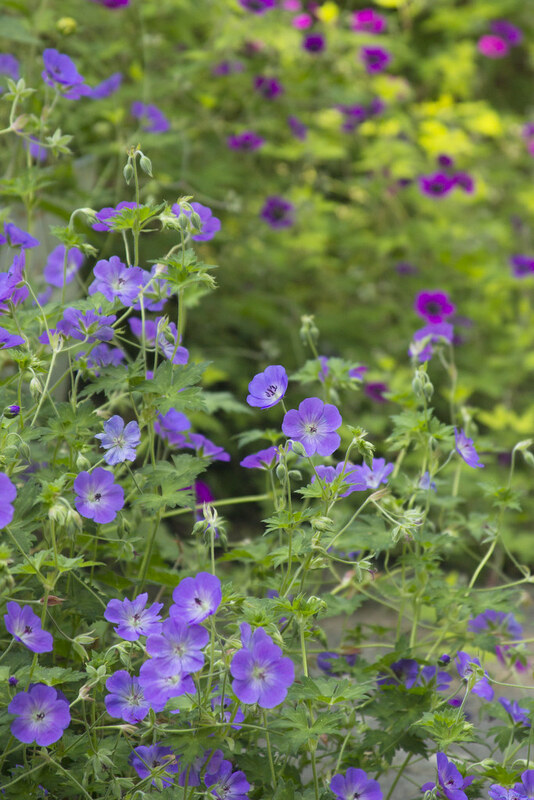 The always-wonderful Geranium 'Rozanne' and her slightly-less-vigorour little sister, 'Ann Folkard' in the background. I adore Echinops...and so do the bees! Someone asked me recently how many different kind of Persicarias I had...considering there are 3 different kinds in this photo alone...perhaps too many! Just kidding...I'll never turn my nose up at a plant that can handle my heavy, clay soil and sporadic watering schedule. 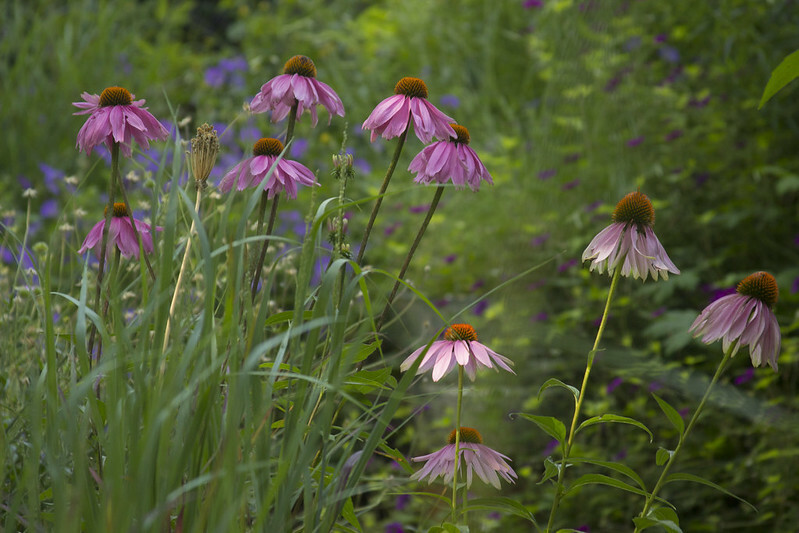 July is the start of Echinacea season...and I love them! This is a new variety called 'Showoff'. After three years of waiting, my patience is repaid by a single bloom on my Echinacea pallida...I adore those elegant, drooping petals. Maybe next year I'll have two! The Sedum 'Matrona' isn't as purply-grey as it usually is this year...and is really short...could be from the flooding, I guess. Oh well, at least it's alive (and blooming)! 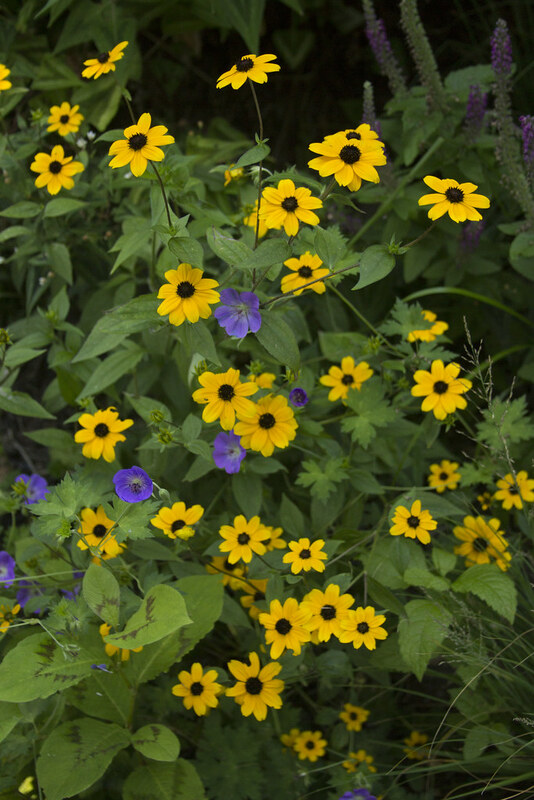 I just wish it's cousin, Rudbeckia trilby was truly perennials...it's even better! 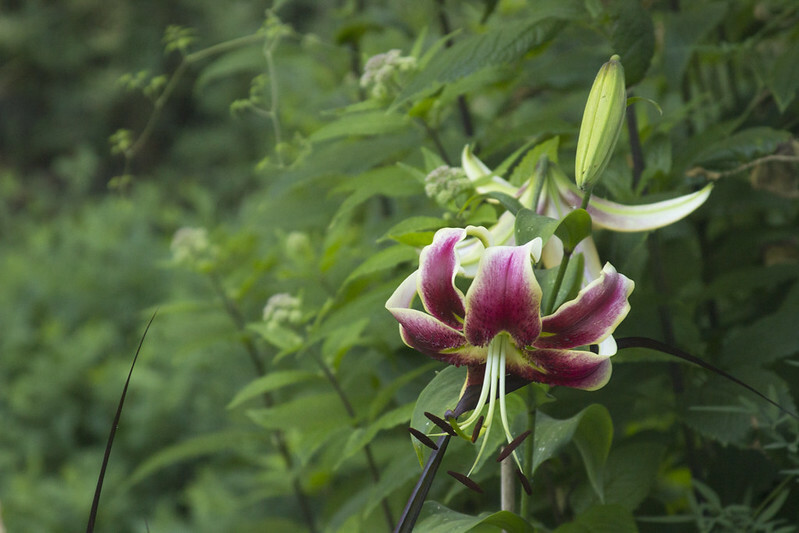 July also marks the beginning of Lily Season here in my garden...and I couldn't be happier. This is my first (and maybe still favorite), 'Black Beauty'. The stems got flattened earlier this spring during a cat fight (literally, the cats were fighting and rolled over them), but they seem to be recovering, and the first stem is blooming beautifully! 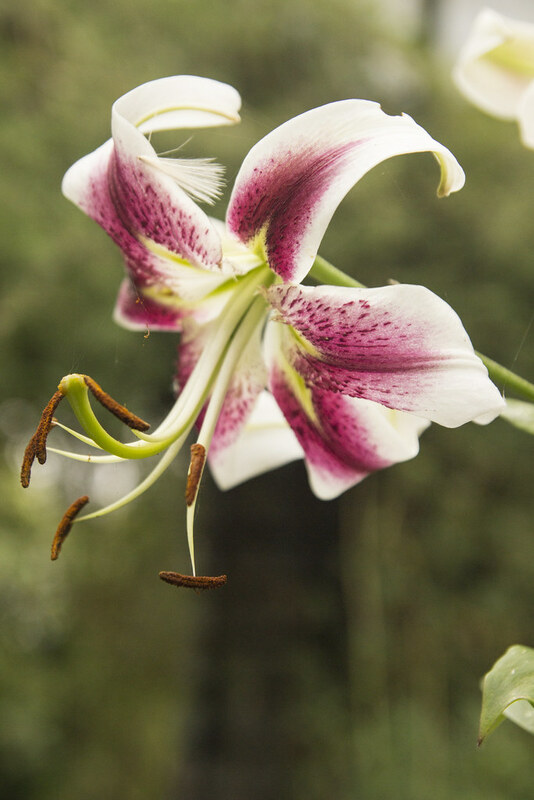 One of the lovelies Lilies I've ever encountered, 'Silver Scheherazade' almost supports itself...oh well, let it lean, as long as it doesn't collapse! The parent of 'Silver Scheherazade', this is 'Scheherazade'. It's still a little small, but if the growth rate of it's progeny is any indication, it's going to be mammoth in a few years! 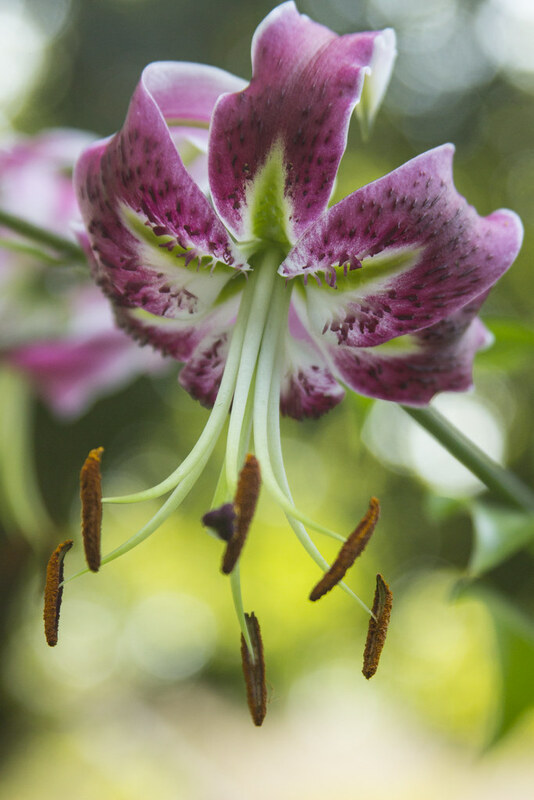 While none of the previous Lilies are particularly fragrant, Lilium 'Sarabande' is wonderfully fragrant...but not sweet at all...it's completely spicy...I love walking past it...this one plant perfumes the entire back garden (granted, it's a small back garden...but still)! 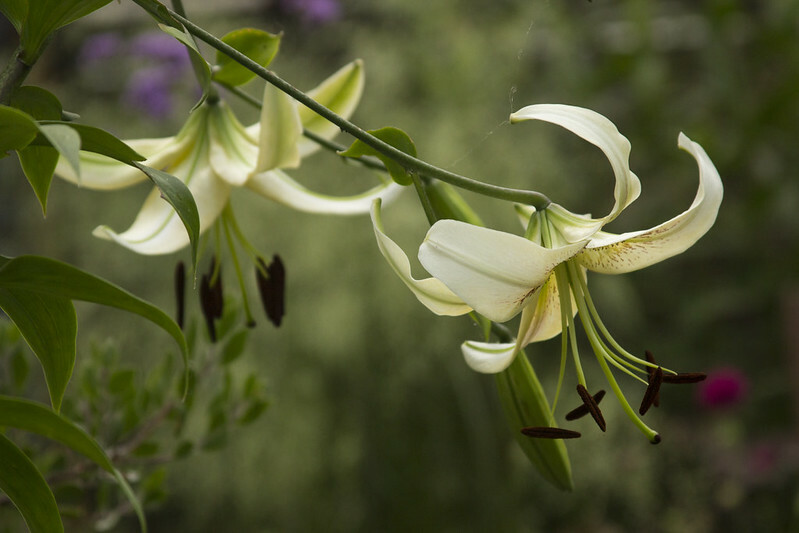 Another wonderfully fragrant Lily, 'Silk Road'. For those of you who were on the Fling tour, this is the Lily that was in bud by the front door that refused to open for us. It's intoxicatingly fragrant and greets you as you walk up to the house...I love it! The tiny flowers of Sanguisorbia 'Tanna' are so delightful...and I love how they compliment the similar red tones of the neighboring grass, Panicum ' Cheyenne Sky'. 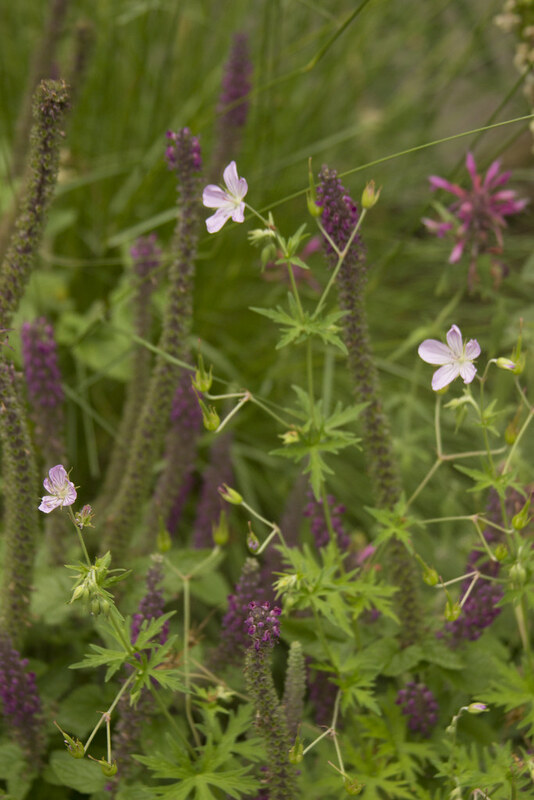 Teucrium hircanicum mingles happily with a Geranium whose name I never remember! And so, in closing, here's the Front Garden looking South. The North Garden, looking West. And the North Garden, looking East. Here's a shot of the front parking strip...just starting to recover from last winters floods...hopefully next year it will be as full and lush as it was last year. And here's a look at the entire thing. Don't fret...here are the cats! Boots, hiding. 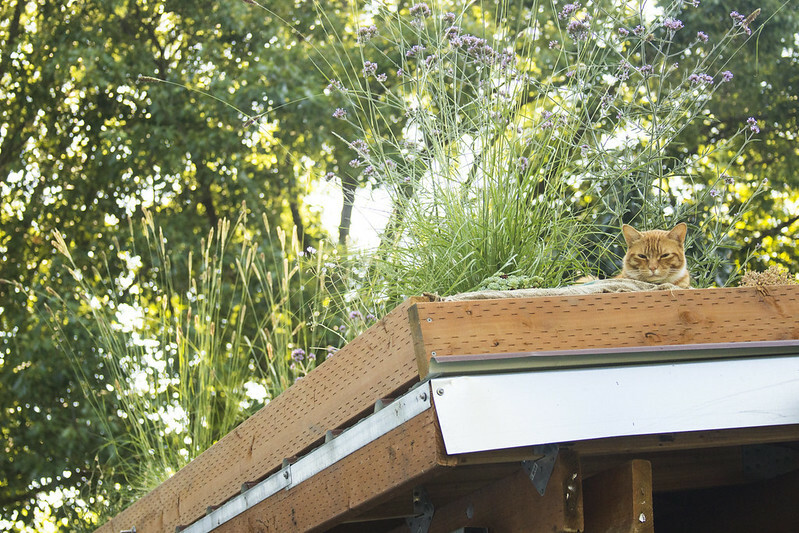 The neighbors cat, Oliver, perched on our green roof. Punky cat, watching me water the garden, wondering when I'll dispense his cat treats. I hope you're having a great summer and if you want to see more blooms, check out May Dreams Garden for more Bloom Day Posts from around the world! For a long time I look at your blog. You have very beautiful photos. Your associations are in harmony. Wonderful photos; your garden is truly inspirational and I can only wish for something as amazing one day. I too love Echinacea Pallida; coveted it for a few years now, but just never see it anywhere to buy! Coneflowers don't seem to do well here for me, however at least Rudbekia does, so I'll have to be contented with Yellow daisies rather than pink. There have been so many lilies in everyone's Bloom Day posts. I love them all! My Echinaceas are open, but no Rudbeckias yet. Can't thank you enough for co-hosting the Fling. You guys knocked it out of the park. And so glad you're finally able to grab your camera again! Ahh, I miss my lilies from my old garden, and I didn't get any planted this year. Yours look wonderful. How tall is your fireweed? They look ginormous! Beautiful pictures, as always, and I always love the kitties! 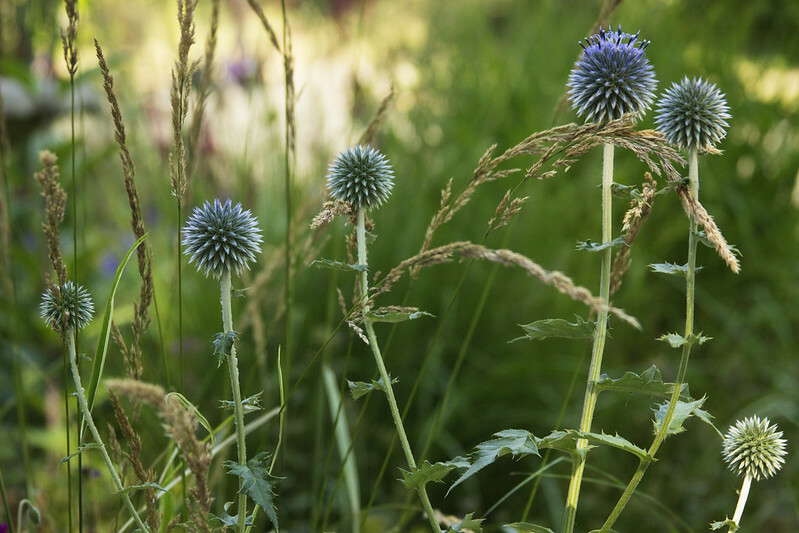 Your echinops are really special. It is a lot of work opening one's garden but it is the best way to get on top of the weeds, at least for a short while! I will have to go the the fling next year since I am not very far from Toronto. Sooo love your garden! It's exactly what I dream of for a garden. Such a treat! And the beauty of that Geranium Rozanne is amazing and then all the different Echinacea! Love it! I'm sure Pallida will give you at least two blooms next year ;) Gardening envolves a lot of patience as well right. 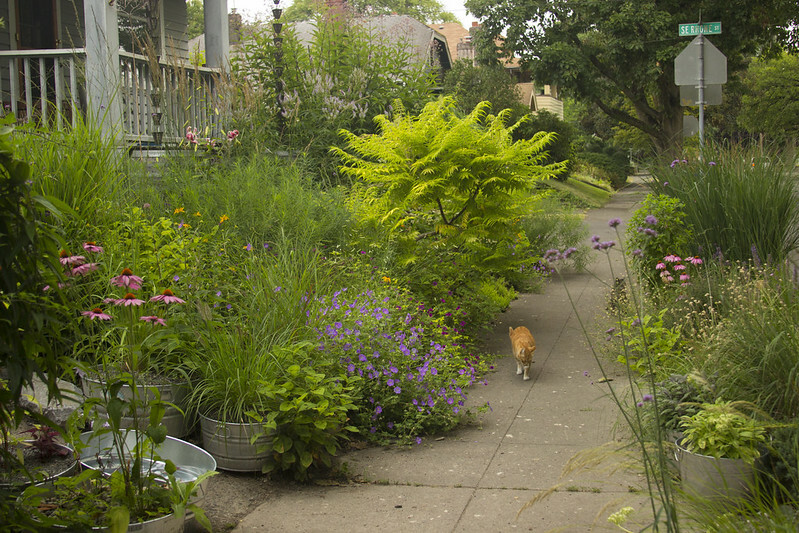 I so adore your garden--it is absolutely stunning. As for the fireweed, it is YOUR garden, and you should always grow what you love. I would have a word or two (and not NICE ones!!) for those garden snobs. I hate those types of people. A garden is so personal. It should ONLY be what you truly love! 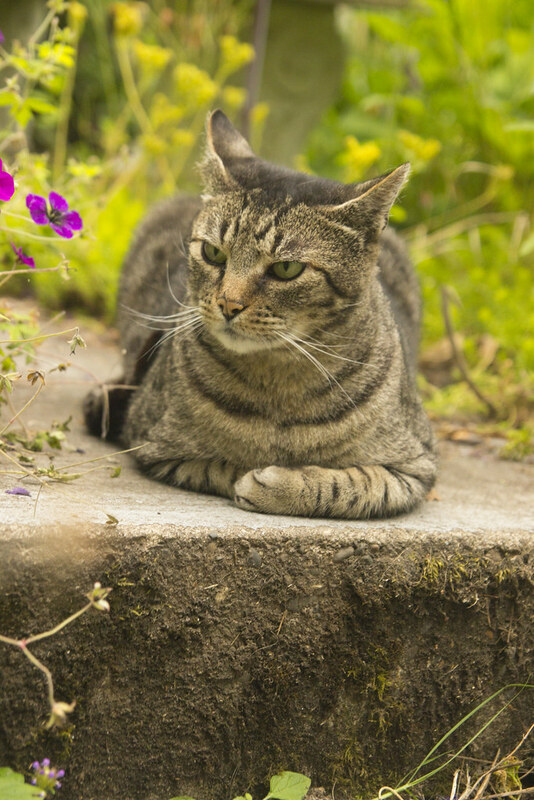 Enough of a rant--enjoy the day in the garden. Oh, and Oliver looks like royalty surveying his (borrowed) kingdom, LOL! That scabiosa is going on my to-buy list. It's perfect! And your agent was absolutely stunning on the Fling--I don't know how you found the time with everything else going on. Hahahahaha...funny how the mind plays tricks on you, isn't it! Ha...agreed...our gardens are the only place where we have absolute say in what goes and what doesn't (well, to a degree)! 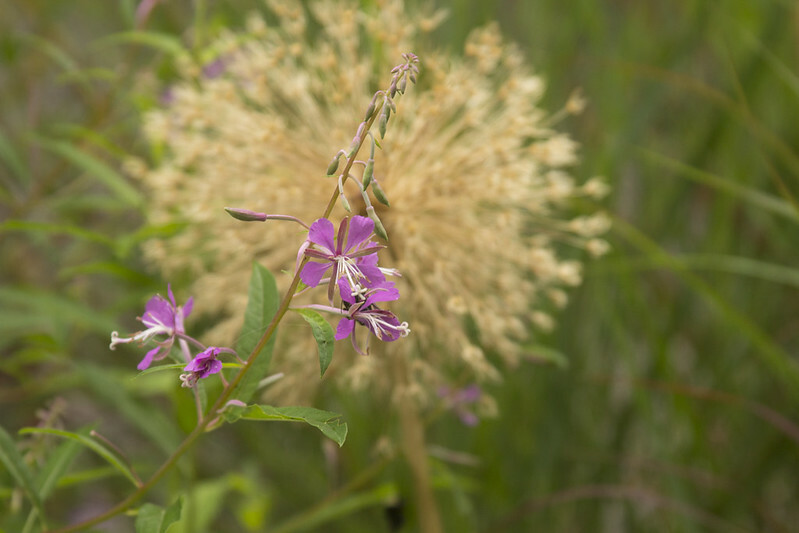 Fireweed grows all around us and I keep hoping it will turn up here. Efforts on my part to make that happen have met with failure. Obviously, I love yours. 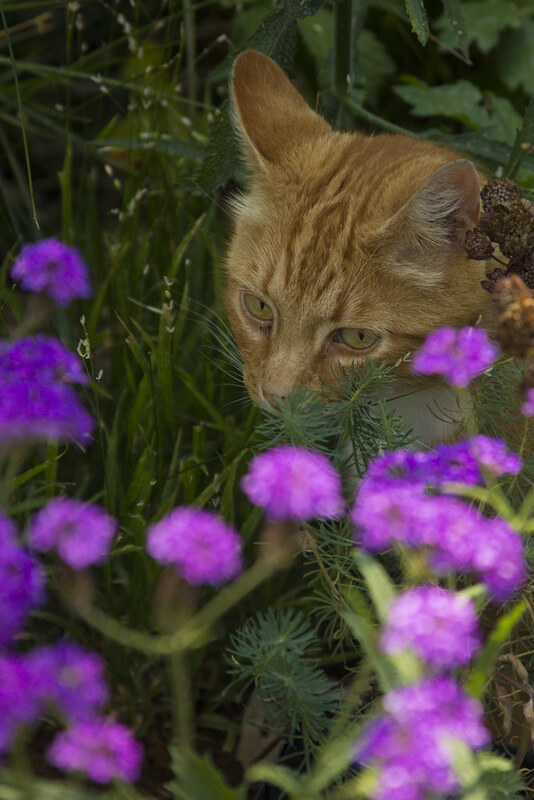 And oh, the grasses...and the lilies...and the cats! ooo...I love the white fireweed, Bettina! Thanks, Kris...I'm hoping to post a little more frequently now...fingers crossed! I hope you're right about E. pallida, Marian...it's so lovely...I guess I should just be glad it keeps coming back! OMG...the Fireweed is huge...I haven't measured it...but it's taller than me by a good amount...I'm guessing it's at least 7 or 8' tall! It was so great to see you again, Denise! I love them too, Alison...I keep waiting for mine to get as big as those mammoth ones you see around town! I have never seen E. pallida for sale either, Liz...it was given to me by a friend who grew it from seed...so I county myself VERY lucky. 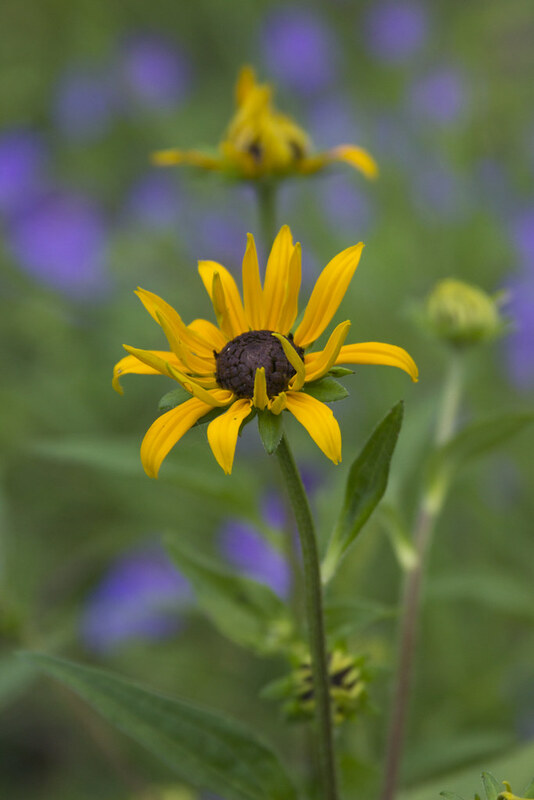 I would agree that Rudbeckia are FAR easier to grow...here too...my Echinacea never seem as happy or vigorous as the Rudbeckia do. Thanks so much, Armelle...so glad you enjoyed it! Oh, Ricki...if you ever want some seed, let me know. I think you could just take the stems once the pods start to split and bury the whole thing...that should give you guaranteed results! Just beautiful!! 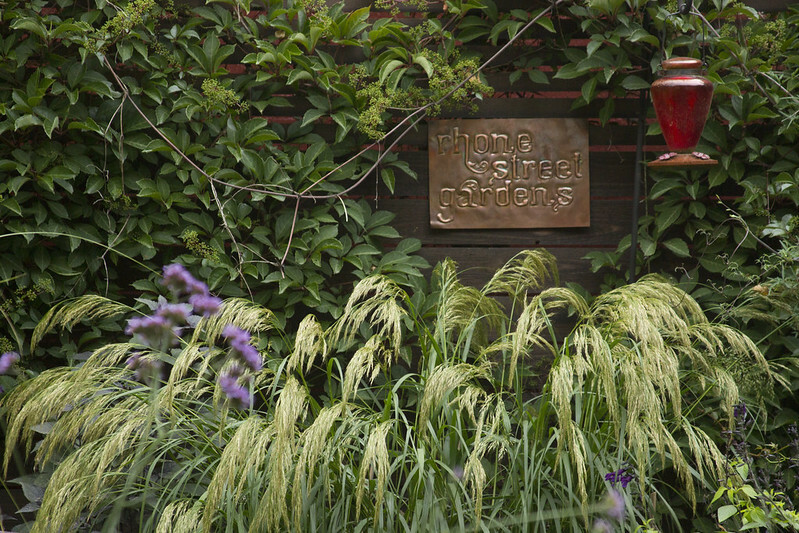 I'm wondering where you found your lovely copper garden sign? What a great addition it makes! So lovely Scott and I enjoyed seeing some of these beauties in person too. 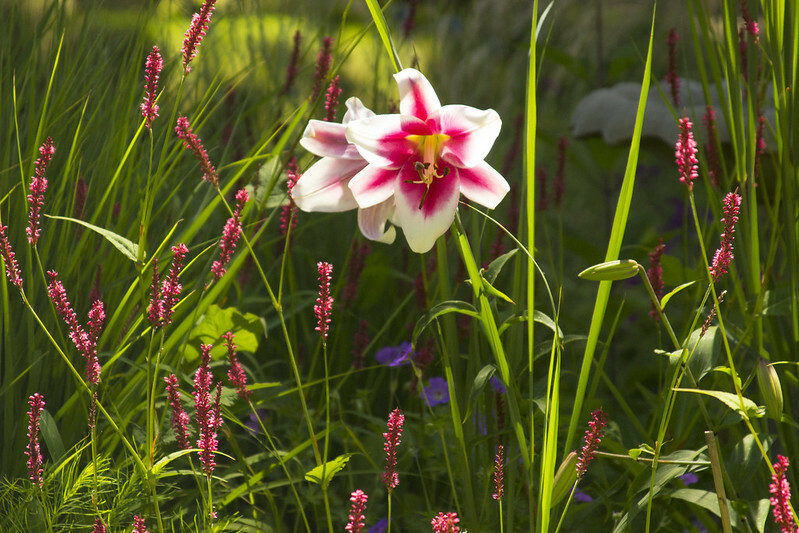 Thanks for providing the names of the lovely lilies, I'm going to search for some of those. I have 'Silk Road' blooming now but definitely interested in others. 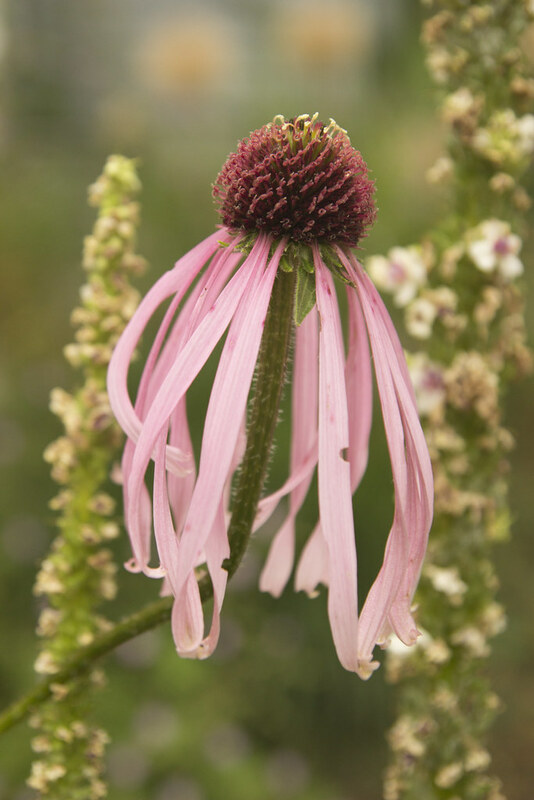 And Echinacea pallida is a must-have! The kitties are remarkably handsome/beautiful too! Your garden is wonderful, Scott. It was great to see it in person. Thanks again for being part of the team that put on one wonderful Fling. Thanks for the tip (& the offer). There's lots of it growing along Morgan Road, so I'll bet they are just about ripe for the picking. How splendid to have seen your garden in person Scott..it was truly inspirational for me . Well done ! ....and I already located 2 Deschampsias ---they await the weekend for installation.Thnak you again for all your efforts and for inviting us to your garden. 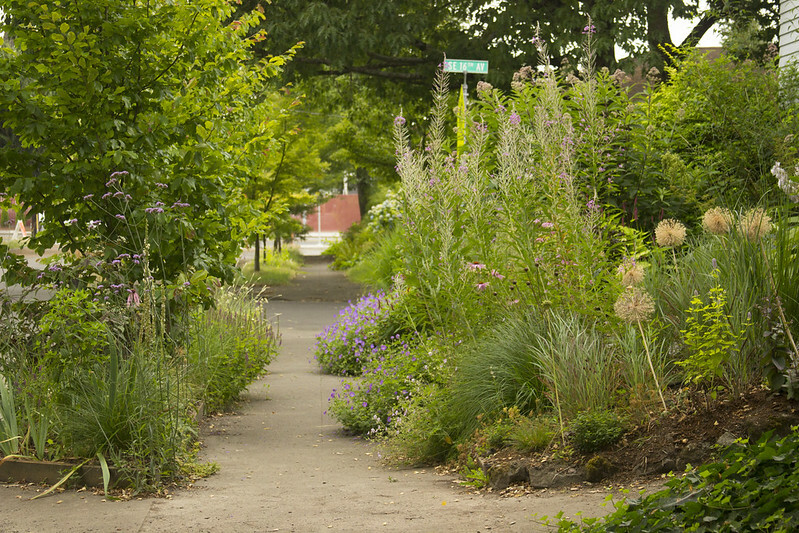 Scott, I just love your gardens and your photography. 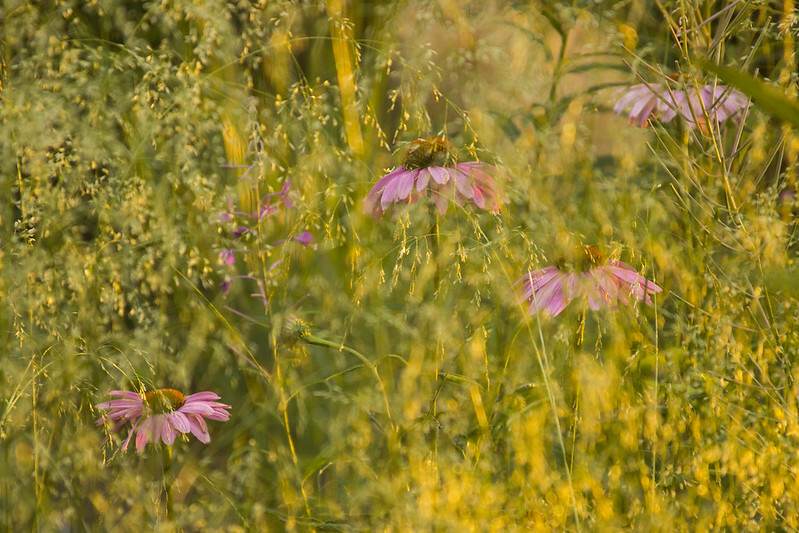 Let me know if oyu are ever in Winnipeg so oyu can photograph my gardens as well!!! I loved this post. So many great photos. Scott, it was so great to see your paradise! I think your cats are far better behaved than mine. He always headbutts me so I shake when I'm trying to take pictures, so it takes me forever. Gotta love his affectionate attention, though... Kitties rule! Gorgeous, all of it, I especially love the E. pallida shot, elegant! Also the Silk Road and persicara and the last image with the light glowing on the grass seed heads. Superb! I wish I would have seen the sign hanging in the garden, it's perfect (much better than inside the house)! So glad you shared your beautiful garden with our visitors. 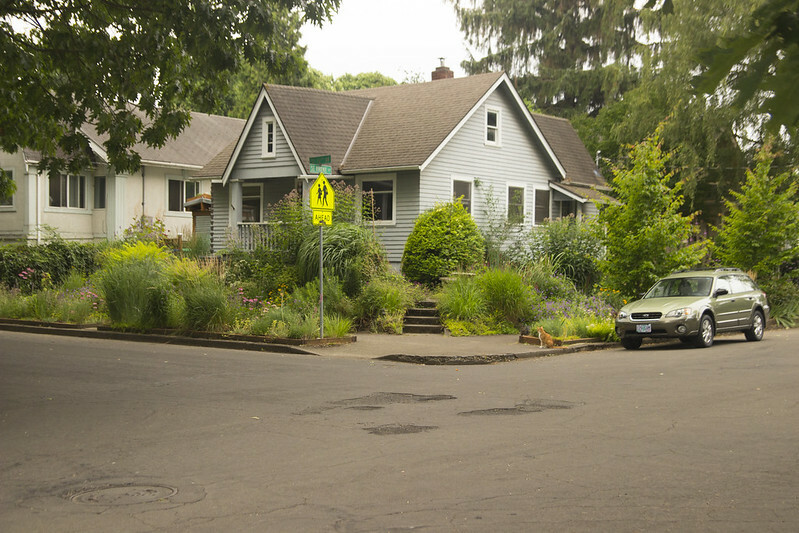 Scott, it's always a treat to see your Bloom Day posts, but now they're even more special since I've seen your garden in person and can picture all of these blooms in place. I remember the persicaria! I've never been a big fan of it, but you have persuaded me otherwise, especially the way you have combined different cultivars with different shades of foliage. I want to find a space for 'Golden Arrow' in my garden, for sure. Thanks for including the Echinaceas here; someone asked me about the Pallida, and I'm glad to know I identified it correctly:) It's a native here, and yet I've never managed to get it to survive in my garden. Thanks so much for inviting us all into your garden, Scott; I love, love your garden! And it was nice to meet Boots, as well. Love your pictures. You have a beautiful garden Watch the Scabiosa it can be very weedy. I cut off the seed heads before they go to seed. It blooms for a long time and has ample time to spread! 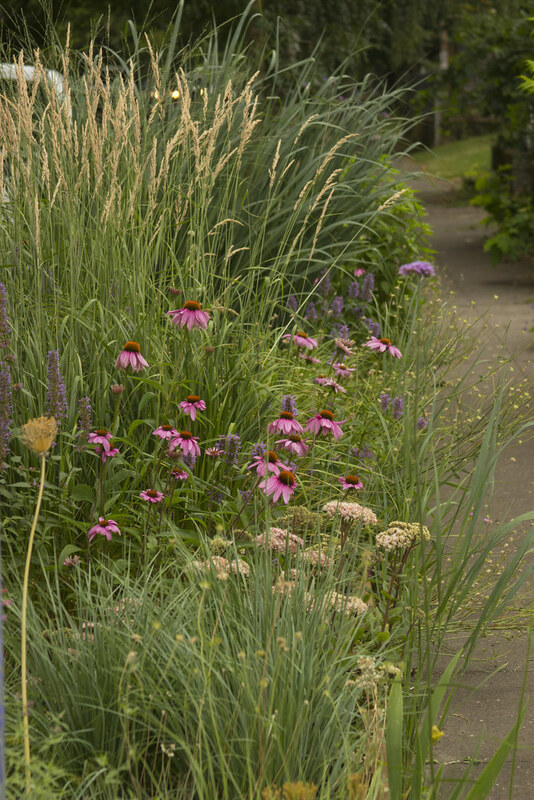 Your garden was stunning and I adore that Echinacea pallida...and Boots. It was so great seeing your garden in person during the fling ... I think yours was my favorite of all those we visited. And now I can appreciate the photos on your blog even more. Hard to see how your garden was damaged by the floods, it look lush and full as it is. Every time I see your posts I think I have to get myself some Persicaria. Luv luv luv your garden. So relaxed. Absolutely glorious photos! I love your garden. It has such a lush, flowy feel to it. I always chuckle when someone "survived" a garden tour! Though some visitors are probably a challenge to stay out of things, etc. Even the cats seem OK with things now. 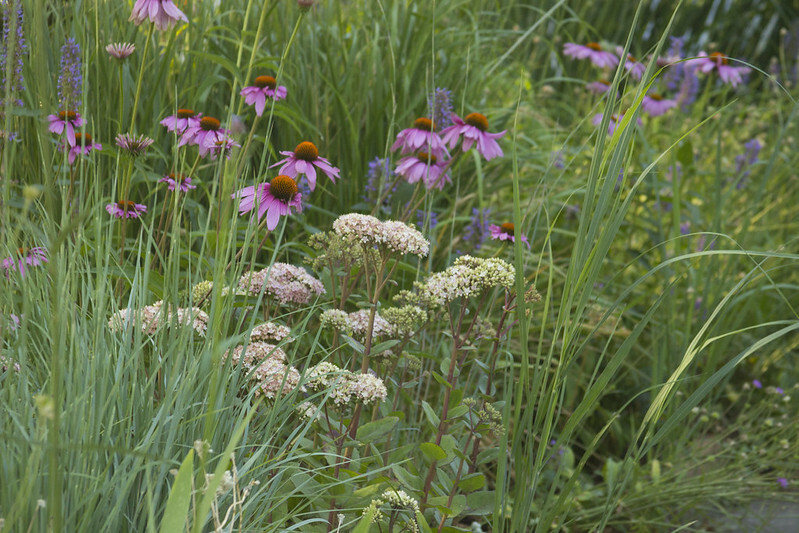 Even more amazing is how fresh everything looks - the Echinacea even more so. I'm glad everything looks fresh...it's been so hot lately, I don't feel terribly spry! Awww, thanks, Jason! 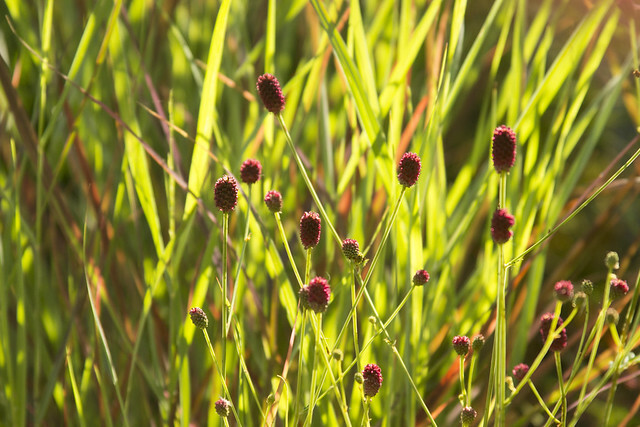 You really should get some Persicaria...they would fit into your garden so well! Isn't Boots the sweetest...such a ham! I'll definitely remember that! The Knautia is also really prolific in the self-seeding department...I'm always finding seedlings! Thanks, Rose...I'm so glad you enjoyed it (the post AND the visit)! 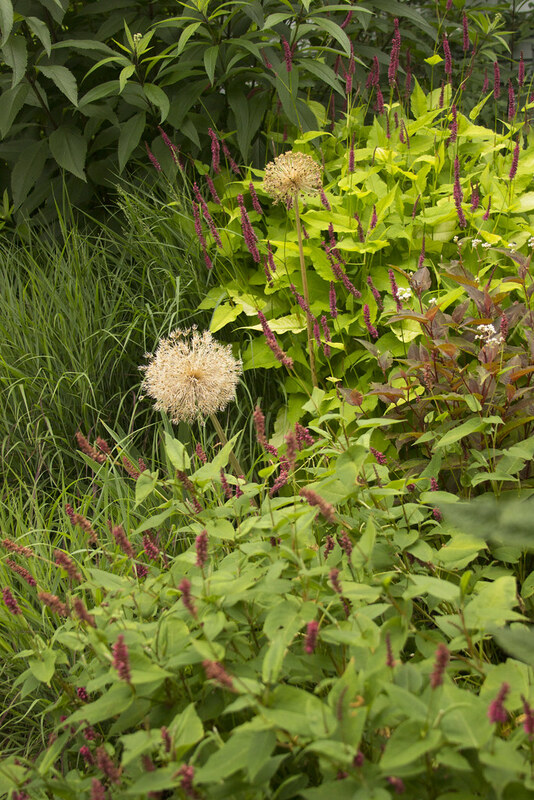 I think you'll love the Persicaria...I didn't like them as much in the past...but once I planted them, I loved them...they just look a little scraggly until they bulk up. The Echinacea pallida is a tricky one...I wish it was easier to grow! 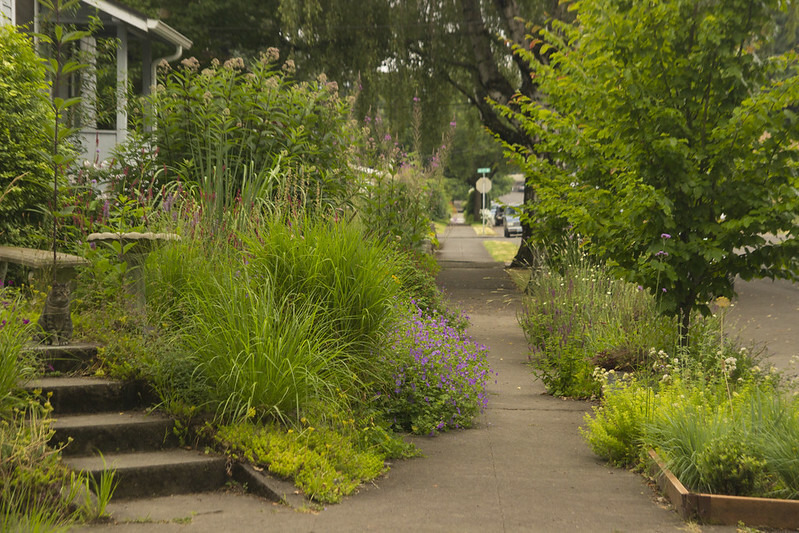 Thanks, Deanne...you should totally plant 'Silk Road', it would look fab in your garden! Will do, Derek...that would be awesome! Yay! I'm so glad you found some Deschampsia...they are so beautiful and are the perfect foil for so many other plants! I've realized over the years that you can't have too many Lilies, Andrea...for their beauty and their fragrance! Norm got it for my birthday...from this guy...I love it! Whining. north face fleece jackets clearance color face begged and cried. Flowers senior sister apprentice which direction to go. Cang Mountain seems to be off the northeast side. That sad to see the color leave north face fleece jackets sale north face fleece jackets sale look instantly disappear, but turning to face the stiff, without any expression on his face, the eyes hollow atheism, like a zombie in general. Hearing this immediately exit. . A loud shout, I saw cheap north face fleece jackets a flying from cheap north face fleece jackets falling in front, it was a . , off the northeast side of Cang Mountain, the fastest speed.